Five years ago the Special collections of the University Library Leiden acquired the book and manuscript collection from the estate of J.M.H. van de Sande (d. 2010), a Dutch pharmacist. As part of the ERC-project on the writing practices of physicians, led by Volker Hess and Andrew Mendelsohn at the Charité in Berlin, I examined one of these manuscripts, now catalogued as BPL 3603. One of Van de Sande´s special interests was Paracelsus and Jan Baptista van Helmont (1579-1644). This interest would explain how this Dutch language manuscript of seventy folios came into his possession. Indeed, on the ex libris of Van de Sande´s Bibliotheca Pharmacia, the note “612.8 Helm”, suggests that Van den Sande catalogued the manuscript with other works by Van Helmont. 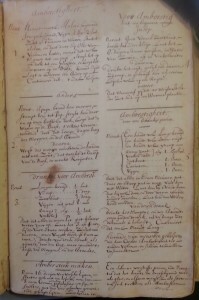 More pencil writing on the same page reads “Van Helmond´s recepten” or Van Helmond´s recipes. Sietske Fransen, who has researched Van Helmont and his son Franciscus Mercurius van Helmont (1614-1699) (see for example (16/10/2014) and (30/12/ 2014 ), and I decided to contribute a new series on this Dutch recipe book to The Recipe Project. It will be a great way to continue our research on this manuscript and share our discoveries, similarly to the way Hillary Nunn and Rebecca Laroche have done here. Our starting point will be to ask what the manuscript can tell us about its anonymous author or authors and their reading and writing practices. Taking a closer look at the manuscript it is clear that it contains material from Van Helmont’s publications besides recipes. It also contains recipes from Heinrich Cornelius Agrippa von Nettesheim (1486-1535) and Johan van Beverwijck (1594-1647), amongst others. Its dating of ca. 1677 is based on the appearance of this date on the first page of the manuscript and correlates to the latest dates noted with the recipes. Universiteitsbibliotheek Leiden BPL 3603 fol.2r. The first recipe is for “amborstigheit”, or shortness of breath. The recipes themselves are at first arranged alphabetically according to the affliction they are directed at. From about halfway through the manuscript, however, they are also grouped together according to the product of the recipe or its main ingredient. They are evenly and uniformly distributed over the page and leave only limited space for additions. All of the recipes are in Dutch. 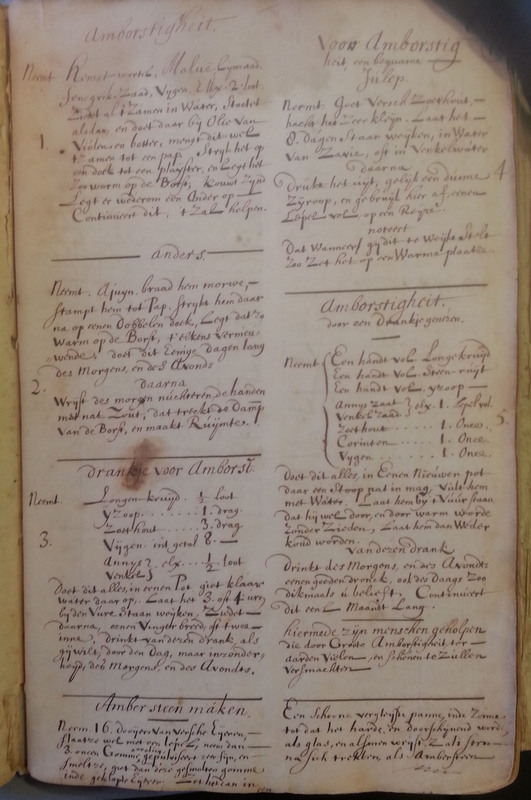 The initial alphabetical order as well as the little annotation space suggests that the manuscript was carefully designed as a more or less final record of recipes. Universiteitsbibliotheek Leiden BPL 3603 (n.p.) fol.1r. The date “1677” can be seen at the bottom of the third table. A few things immediately intrigued us about the manuscript. 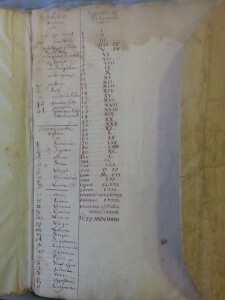 Instead of a title page, the first page contains three very basic tables: that of pharmaceutical signs; of astrological signs; and a list of conversions of Arabic to Roman numerals. On the final page we find a table entitled “explanation of characters in general use of alchemists” and one of “characters and weights of medics and apothecaries”. A question we would like to raise for further discussion is what the inclusion of such tables, says about the intention behind the compilation of the manuscript. Furthermore, those few sources for the recipes that are named, appear to be printed books. 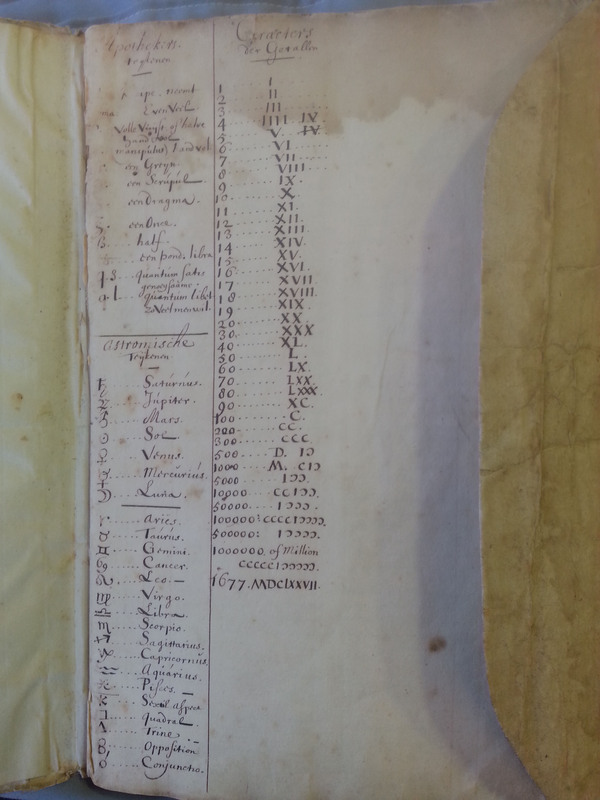 The sources show that the compiler of the collection was a keen reader of medical works in Dutch. The popularity of these publications can be gauged from their increasing number on the market in the decades before and following the composition of the manuscript. Much less is known however about how and by whom these books were read. This manuscript promises to tell us a great deal about the practices of a reader of these publications. Finally, it is very exciting to see texts by two contemporary physicians from the Northern and Southern Netherlands together in the manuscript. Although Van Beverwijck from Dordrecht and Van Helmont from Brussels both wrote in Dutch, they are rarely discussed together in the historical literature. This is understandable from the character of their writings. An engraving and the beginning of a poem by Cats, illustrating the chapter “What life consists of and by what means it is maintained in health”. 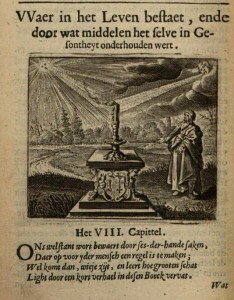 Johan van Beverwijck, Schat der Gesont heyt (Amsterdam 1643) p. 60. 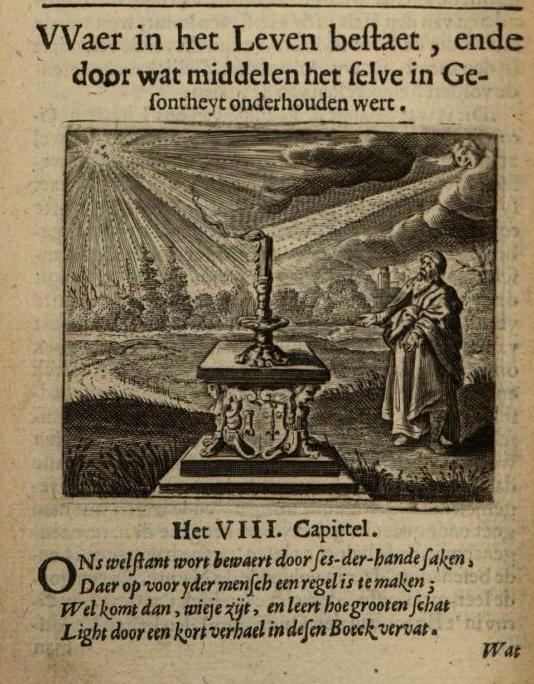 Van Beverwijck published several medical books in Dutch, most notably Schat der Gesontheyt (Treasure of Health) and Schat der Ongesontheyt (Treasure of Unhealth iness), which became very popular and appeared in many editions from the 1630’s onwards. 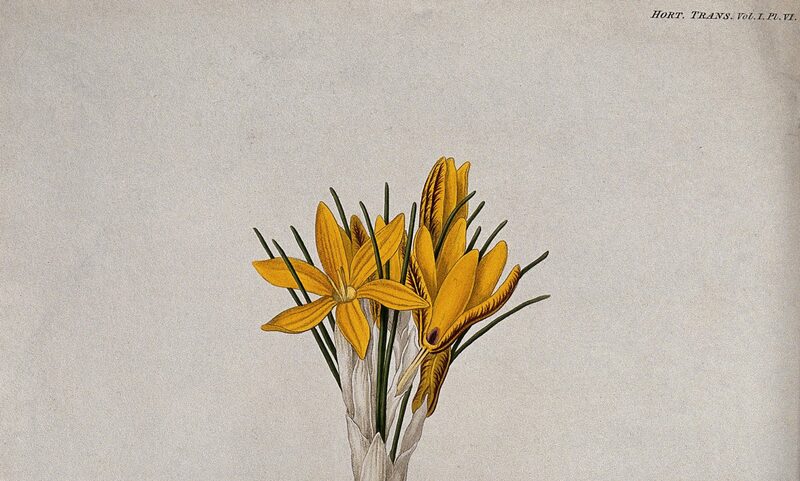 In these publications his medical writings were alternated with poems by the famous Dutch poet Jacob Cats (1577-1660) and illustrated with engravings. The fame of these books made Van Beverwijck a household name. Van Beverwijck thus effectively adapted the medicine he was taught at university to a non-academic audience. Van Helmont on the other hand is best known for his Latin works, such as Ortus Medicinae (The Rise of Medicine, 1648), while his Dutch medical publication Dageraed (1659) is much less known. And despite the vernacular language, this book is not as accessible as Van Bever- wijck’s publications with its poems and pictures, and was not read widely by the seventeenth-century Dutch audience. Despite their contrasting reputations, the compiler of BPL 3603 apparently considered both authors to be valuable resources for his recipe book. The manuscript provides us therefore with an exciting example of seventeenth-century comparative reading of two authors that were thought to be read by different audiences. We look forward to finding out more about the assembler of the manuscript as well as the way in which he used his sources. Next month, Sietske will discuss the material from Van Helmont further. What a fascinating source and a terrific idea for a series; I look forward to the forthcoming articles.